Preheat convection oven to 325 degrees (or 350 for regular oven). Rinse chicken well and pat dry. Fold back wings under back and fold back legs into cavity. Tuck head under wing. Slowly insert index finger between the skin on the breast and separate by making two large pockets. Push all the way up to the neck – you’ll need the room. Take 2 tablespoons of the butter and place into the right side of the pocket. Do the same with the left side of the pocket. Massage the breast skin until the butter is completely rubbed into the breast and there are no visible bumps. Mix the olive oil with the salt and brush all over the bird. Place on roasting rack and cook for 1 hour at 325 degrees, basting every 30 minutes. Then broil for 7 minutes to crisp up the skin. Remove from oven and let the bird rest for 10 minutes. 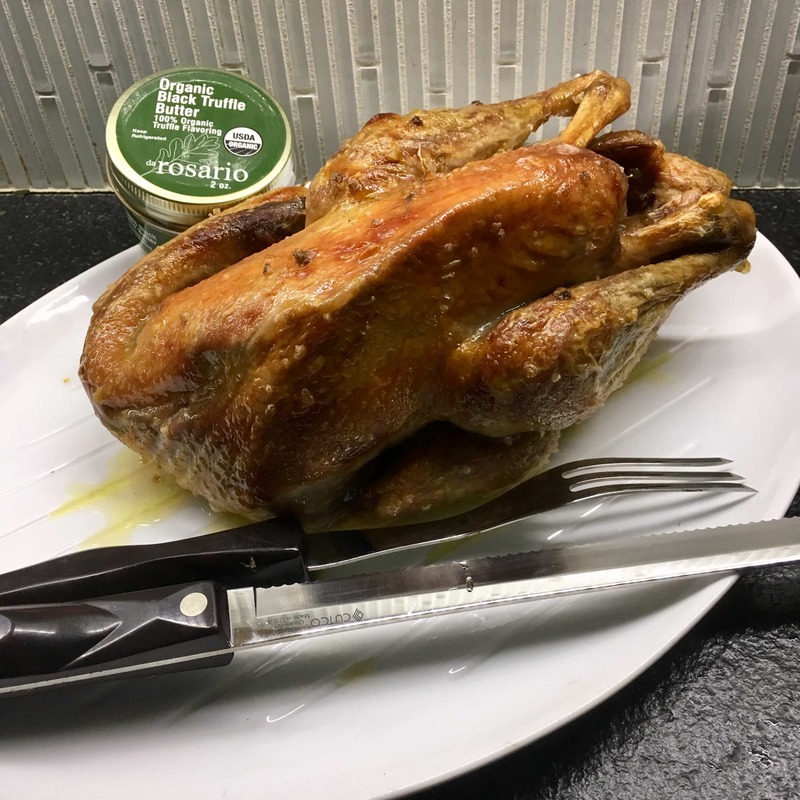 Spread the remaining truffle butter over the bird with a fork until it melts. Quarter the bird at the table and serve with cooked greens and sweet potato mash.